Senate transmits ‘Not Too Young To Run Bill’, 11 others to Buhari for assent – Royal Times of Nigeria. The Senate on Tuesday resolved to transmit the Age Reduction Bill (Not Too Young to Run Bill) and 11 others, to President Muhammadu Buhari, for assent. The resolution was sequel to a motion titled, “Passage of Constitution (fourth) alteration bills, 2018”, sponsored by the Deputy Senate President, Ike Ekwerwmadu and 49 other senators. 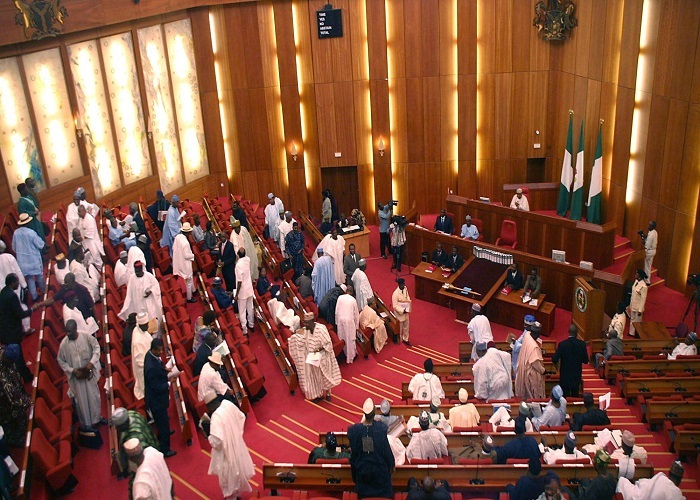 The bills to be transmitted by the Senate include: Authorisation of Expenditure in absence of Appropriation Bill, Financial Autonomy of State Legislatures Bill, the Legislature Bill, Political Parties and Electoral Matters Bill, the Nigeria Police Force Bill and Restriction of Tenure of President and Governor Bill. Others are: Submission from the Judiciary Bill, Determination of Pre-Election Matters Bill, Consequential Amendment on Civil Defence Bill, Procedure for Overriding Presidential Veto in Constitutional Alteration, and Timeline for the Presentation of Appropriation Bill. The Senate Leader, Ahmad Lawan, who moved the motion, recalled that while the Senate approved 29 of the bills with the required two-third majority of members, the House of Representatives approved 21 of the bills with not less that two-third majority. He explained that 35 State Houses of Assembly have forwarded their resolution on most of the bills. The states are Abia, Adamawa, Akwa-Ibom, Anambra, Bayelsa, Bauchi, Benue, Borno, Cross River, Delta, Ebonyi, Edo, Ekiti, Enugu, Gombe, Imo, Jigawa, Kaduna, Kano and Katsina States. Others are Kebbi, Kogi, Kwara, Nasarawa, Niger, Ogun, Ondo, Osun, Oyo, Plateau, Rivers, Sokoto, Taraba, Yobe and Zamfara States. The Senate, thereafter, resolved that while awaiting the resolution of some of the State Houses of Assembly on some of the Bills, those that have met the requirements of the provisions of Section 9 of the Constitution and passed, the processed in line with the Acts Authentication Act be transmitted to Mr Buhari for his assent, ”to enable institutions of government prepare for immediate implementation of policies and programmes pursuant to the provisions”. The Senate passed 12 of the 33 bills seeking to alter various provisions of the Constitution.